Can has been with Liverpool since 2014. 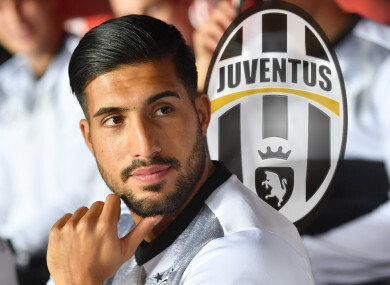 LIVERPOOL DEFENSIVE MIDFIELDER Emre Can has agreed a five-year contract with Italian champions Juventus, according to reports in Italy. The 24-year-old German international, who is sidelined with a back injury, will sign with the Italian champions as early as this week, Gazzetta dello Sport report. The midfielder can leave Liverpool on a free transfer at the end of the season, and Gazzetta reported that the German has already agreed a deal worth €6 million per year. French champions Paris Saint-Germain were also reported to be interested in signing Can who preferred a move to Italy with fellow Germans Sami Khedira and Benedikt Howedes already in Turin. Can arrived in Liverpool in 2014 from Bayer Leverkusen, having previously won the Bundesliga title with Bayern Munich in 2013. Email “Liverpool midfielder Can agrees five-year deal with Juventus - reports”. Feedback on “Liverpool midfielder Can agrees five-year deal with Juventus - reports”.